People of good will take a certain pleasure in seeing truth defended with conviction, with a combination of intelligence and fortitude that does not buckle in the face of error and opposition. Some subjects excite righteous passions more than others, perhaps. One of these is our own Blessed Lady — Mary, the Mother of God. The virginity post partum (after the birth of Christ) of the Blessed Virgin is one of those doctrines that is cavalierly tossed aside by heretics of different stripes. Today, many so-called “fundamentalist” Protestants continue to misrepresent those Gospel verses which speak of the “brethren” of Jesus, verses which refer to His relatives, not to actual “brothers” and “sisters.” Thus, they choose to believe that Our Lady and St. Joseph had children after the virgin birth of Christ — in contradiction to the teachings of their own forerunners, Luther, Calvin and Zwingli, who maintained at least enough presence of mind to uphold Mary’s Perpetual Virginity. This particular assault on the Mother of the Savior is nothing new. The serpent in Eden heard God’s own prophecy about the “Woman” — the Mother of a Son — who would crush his head beneath Her heel. He has hated Her ever since, and naturally (or un-naturally, as the case may be), inspires others to do so. Our Lady is the very image of the Catholic Church. Her maternity brought forth the Redeemer; that of the Church brings forth the brethren of the Redeemer. Small wonder, then, that Mary — Virgin and Mother — should come under special attack. The heretic, Cerinthus (who flourished c. 100 A.D.), influenced by gnosticism, taught that Jesus “received” Christ at His baptism — as a power or revelation from the “unknown” Father — and that this Christ left Jesus before the Passion. In his Adversus haereses (Against Heresies), St. Irenaeus (+202), Father of the Church, recorded that Cerinthus “represented Jesus as having not been born of a virgin, but as being the son of Joseph and Mary according to the ordinary course of human generation, while He nevertheless was more righteous, prudent, and wise than other men.” Here is an early example of sacrilege hiding behind a professed “respect” for Jesus. Why such passion over Our Lady’s Perpetual Virginity? It is understandable that Her virginity ante partum (before the birth of Jesus) should be so jealously safeguarded, for Her Son was and remains the Only-Begotten Son of God. Why express so much concern over Her life with St. Joseph after the birth of the Savior? In the Gospels, Our Lord is referred to as the “first-born” in two different, but complementary, contexts. He is “the image of the invisible God, the first-born of every creature” (Col. 1:15), proceeding from all eternity from the Father. Because He is both True God and True Man, He alone was able to pay the debt incurred by mankind at the Fall. As True Man, He could pay a debt owed by mankind to its Creator; as True God, this satisfaction, these merits, could atone for an offense committed against the eternal and omnipotent Creator. And so, Our Lord is “the faithful witness, the first begotten of the dead” (Apoc. 1:5), the first to rise to immortal life. “He is the head of the Body, the Church” (Col. 1:18). “For as the body is one, and hath many members: and all the members of the body, whereas they are many, yet are one body, so also is Christ. For in one Spirit were we all baptized into one, whether Jews or Gentiles, whether bond or free: and in one Spirit we have all been made to drink” (1 Cor. 12:12-13). “Of His fullness we all have received, and grace for grace (Jn. 1:16)…. As the branch cannot bear fruit of itself, unless it abide in the vine, so neither can you, unless you abide in Me. I am the vine; you the branches” (Jn. 15:4-5). “But when the fullness of the time was come, God sent His Son, made of a woman, made under the law: that He might redeem those who were under the law: that we might receive the adoption of sons. And because you are sons, God hath sent the Spirit of His Son into your hearts, crying: Abba, Father” (Gal. 4:4-6). “And if sons, heirs also: heirs indeed of God, and joint-heirs with Christ” (Rom. 8:17). Through the Incarnation, the taking upon Himself of our human nature by the Second Person of the Blessed Trinity, we share God as Father with Jesus. He tells us, in no uncertain terms, “You therefore shall pray in this manner: Our Father Who art in Heaven, hallowed be Thy name” (Mt. 6:9). The “first-born” of every creature…Who became the “first begotten of the dead”…was and always will be the “first-born Son” of the Blessed Virgin. If the Incarnation created a unique bond between God and man (heirs indeed of God), and a unique relation of mankind to the Incarnate Word (He is the head of the Body, the Church), then it also created a unique bond between the redeemed and Our Lady, the Mother of our “Head” (Behold thy Mother). When the youthful Virgin offered Her fiat to the Angel Gabriel — “Be it done to me according to thy word” (Lk. 1:38) — She consented to become the Mother of the Redeemer. However, to imagine that such a consent was directed solely to the physical birth of the Redeemer, to the exclusion of any other considerations, is ludicrous. A mother does not await the birth of her child, so that she can “get it over with” and have nothing more to do with her offspring! Mary knew that Her Son was God. She knew the prophecies concerning the Redeemer, and of the Woman foretold in Eden, who would be by His side. Her fiat was a consent to bear the Redeemer, to raise Him, provide for Him, protect Him and serve Him as He desired to be served. Mary’s fiat, then, was also an implicit acceptance of Her Spiritual Motherhood, Her motherhood “in the order of grace” of each and every member of the Church. 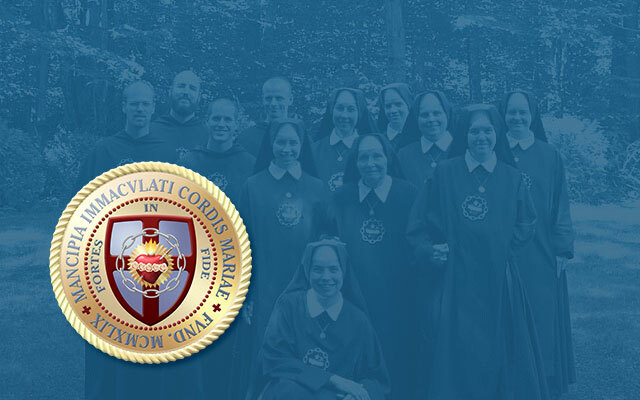 Having consecrated herself — Her virginity, Her life, all Her actions — to the service of God, and having accepted the awesome Divine Maternity, She presented herself as the “handmaid” of the Lord. She is at His disposal. Unlike most people, who give only so much to God — in accord with their means and station in life — Mary placed Herself at His service totally, in all matters. So, when She said ‘yes’ to the Angel Gabriel, She said ‘yes’ to everything God was offering Her, all the joys, sorrows, and roles that were to be Hers and Hers alone. Thus, Our Lady consented — implicitly — to Her roles as Co-redemptrix, as Mediatrix of All Graces and as Spiritual Mother of the Church. “Now there stood by the Cross of Jesus, His Mother, and His Mother’s sister, Mary of Cleophas, and Mary Magdalene. When Jesus, therefore, saw His Mother, and the disciple standing, whom He loved, He saith to His Mother; Woman, Behold thy Son. After that, He saith to the disciple; Behold thy Mother. And that hour the disciple took Her to his own. Afterwards Jesus knowing that all things were now accomplished, that the Scriptures might be fulfilled, said; I thirst” (Jn. 19:25-28). “The foundations thereof are in the holy mountains: The Lord loveth the gates of Sion above all the tabernacles of Jacob. Glorious things are said of thee, O city of God… Shall not Sion say: This man and that man is born in her? And the Highest Himself hath founded her” (Ps. 86). “And there appeared a great sign in Heaven: a Woman clothed with the sun, and the moon under her feet, and on her head a crown of twelve stars. And being with child, she cried travailing in birth, and was in pain to be delivered…. And the dragon was angry against the Woman: and went to make war with the rest of her seed, who keep the commandments of God, and have the testimony of Jesus Christ” (Apoc. 12:1-2,17). If the same mother gives birth to both the head and members of a single body, then Our Lord gave us the same Mother that He knows and loves. He gave Her to us in all Her glory, in all Her grace, in all Her beauty… and in all Her virginal purity. He gave us, therefore, a Virgin Mother. This is why Catholics defend Mary’s Perpetual Virginity, not as though it were an abstract doctrine fit only for scholars to debate, but as a matter of both a mother’s honor and an aid to understanding the very nature of the Church. When the young Mary consented to become the Mother of the Redeemer, She implicitly consented to become the Mother of the Redeemed. The members of the Catholic Church are the spiritual children borne by Our Lady after having given birth to Her natural Son, Jesus. The Blessed Virgin, as Mother of the Church — and St. Joseph, as well, as Universal Patron of the Church — would be given numerous offspring. But this family would not be their natural family. The womb of Mary — the first and most sacred of all Tabernacles — would not be home to any other child, after it had held the Living God for nine months. And Joseph… well, he knew, better than anyone else did, that his beloved wife was consecrated to God, body and soul, beloved by, and set apart for, the Holy Trinity like no one before or since. No, the offspring of the Blessed Virgin would not be Her natural children, but Her supernatural children — i.e., the glorious family foretold to Abraham when God said: “Look up to heaven and number the stars if thou canst…. So shall thy seed be” (Gen. 15:5). This “seed” is identical to “the rest of Her seed,” the Church as described in St. John’s apocalyptic vision. The Virgin Mother of Christ is the Virgin Mother of the Church. The doctrine of Mary’s Perpetual Virginity is of a piece with this simple fact. It is not an incidental belief. Detractors of Mary’s Perpetual Virginity would do well to consider the Annunciation narrative of St. Luke’s Gospel. Is it not curious that, at such a momentous, even troubling time, this young girl, Mary, should ask one question only, a question which, considering the circumstances, must have been of paramount importance for Her to give voice to it then and there: “How shall this be done, because I know not man?” (Lk. 1:34)? One can imagine the protestations arising on this point from those malcontents who will insist on placing the Immaculata in carnal scenarios. The faithful Israelites of Mary’s day awaited the coming of the Messiah. The birth of every child brought that day closer and closer. Can a “vow of virginity” make sense, then, to a betrothed woman — of all people — when children were considered the greatest blessing of all? “Behold the inheritance of the Lord are children: the reward, the fruit of the womb” (Ps. 126:3). “Thy wife as a fruitful vine, on the sides of thy house. Thy children as olive plants round about thy table. Behold, thus shall the man be blessed that feareth the Lord” (Ps. 127:3-4). A barren woman, conversely, was deemed to be under a divine malediction. The Scriptures say of Anna, the mother of Samuel, before she conceived her son: “And the Lord had shut up her womb” (1 Kgs. 1:5). St. Elizabeth, who was advanced in years at the birth of her son, St. John the Baptist, said, after he had been conceived, “Thus hath the Lord dealt with me in the days wherein He hath had regard to take away my reproach among men” (Lk. 1:25). Would a woman given in marriage repudiate the possibility of raising a family, perhaps even the awaited Messiah? “And he [Jacob] made a vow, saying: If God shall be with me, and shall keep me in the way, by which I walk, and shall give me bread to eat, and raiment to put on, and I shall return prosperously to my father’s house: the Lord shall be my God” (Gen. 28:20-21). Vows were also made by individuals or groups in the hopes of attaining greater sanctity and perfection. The “Nazarites,” described in the Book of Numbers (Chap. 6), made a vow “to be sanctified,” by which they would “consecrate themselves to the Lord.” The vow entailed abstinence from wine, from cutting the hair or shaving, from touching a dead body, as well as the performance of special rites, etc. Somewhat closer to Our Lady’s time, we find the Essenes, a Jewish religious group originating in the second century B.C., specifically advocating celibacy. Are the opponents of Our Lady’s Perpetual Virginity asking us to believe that a group of people, conceived in sin, could consecrate themselves to the service of the Lord, but that the same could not be said of Her who was born without the stain of original sin, who loved God above all things from the very beginning of Her existence? Considering the Divine Maternity to which Mary was called, Her future role as Mother of the Redeemer, is it not even more likely that She, above all others, would be consecrated completely and totally to Him? With just how little regard for the awesome grandeur of God-made-Man do Our Lady’s detractors regard Her and Her immaculate womb? “For there are eunuchs who are born so from their mother’s womb: and there are eunuchs, who were made so by men: and there are eunuchs, who have made themselves eunuchs for the kingdom of Heaven. He that can receive, let him receive it” (Mt. 19:12). We need merely heed the Virgin’s own words to understand how deeply the doctrine of Her Perpetual Virginity affects each one of us personally, how vital it is to a proper understanding of our relationship to God and to His Church. “I am the perfect and perpetual Virgin Mary…. Am I not here who am your Mother?” There is nothing esoteric about this doctrine. In fact, it completes a simple diagram (the one shown on this page). There is a unique relationship between Jesus and Mary, and one between Jesus and the Church. These are actual, independent relationships. On Calvary, Our Lord proclaimed Mary as Mother of the Church, a title which had been Hers from the moment She gave Her fiat to the Archangel, indeed from Her very conception. Therefore, the relationship between Mary and the Church must be understood also to be an actual, independent relationship, not something merely inferred from the other relationships, having no substance or character of its own. It is not a mere tangent, but a vital component of this visual representation — i.e., a “side” of the triangle. It is not a theory, deduced from the other relationships, but a meaningful one in its own right… as real as the words of Christ from the Cross. “How is it that you do not belong to the Virgin’s birth, if you are members of Christ? Mary gave birth to our Head; the Church gave birth to you. Indeed, the Church also is both virgin and mother, mother because of Her womb of charity, virgin because of the integrity of Her faith and piety” (Sermo 192). This “womb of charity” also pertains to the Blessed Virgin. If we can speak of a Mystical Body of Christ, composed of Jesus and baptized Catholics redeemed by His Precious Blood, may we not speak also of a Mystical Womb of Mary? The Church baptizes, teaches, absolves — i.e., gives spiritual life to and nourishes souls. Our Lady is the Mother of this Church — She prays, intercedes, guides, admonishes when necessary. Because She united Her sorrows to those of Her Son on Calvary, which redeemed the human race, He has placed in Her loving hands those very graces which He won for us on the Cross, so that “every grace granted to man has three degrees in order; for by God it is communicated to Christ, from Christ it passes to the Virgin, and from the Virgin it descends to us” (St. Bernardine of Sienna +1444). This is only fitting, for the Woman prophesied in Eden would not be a mere “spectator” at the immolation of the Lamb She had borne and reared for the great Sacrifice. This Sacrifice was His, indeed, but She had a place by His side, and Her sorrows will be treasured by Her Divine Son throughout eternity, even if they are too often ignored by mankind. “I know not man…. I am the perfect and perpetual Virgin Mary…. Am I not here who am your Mother?” This is the doctrine of the Perpetual Virginity of the Blessed Virgin in all its depth and simplicity, truly something for which to give heartfelt thanks to God.